I still remember how Indian televisions were crowded with #BleedBlue adds. How people had become crazy about the blue shirt of Indian Cricket Team. It was really nice to watch such a big fan following of Indian Cricket players and more than that being Indian it felt good to see the trust people were showing through those adds, those shouts, those campaigns and those crazy but awesome things. It was all good believe me. Then there came the most awaiting championship in the cricket world i.e. World Cup 2015. Every eye, without any doubt, was set on the last winning team, #TeamIndia . And team India was fully aware about this fact. It could see the bleeding of that blue blood in the emotions of Indian fans. So, our army in blue shirt entered in the battle ground (World Cup 2015) with full spirit. MSD and his soldiers were in no mood to #giveback the trophy to the world. Every Indian channel was campaigning #WontGiveItBack. The spirits were too high. If Dhoni and his brigade were in full mood to taste the success, then Indian fans too were eager to have world cup second time. India won her very first match. And this victory was followed by a series of victories of Indian team in every coming match. India made it to the semi final. People showered their love♥ at Indian players. Everybody praised Indian team. MSD's team was provided with a full fledged support from Indian audience. The day came when India had to fight with Australia in order to collect the ticket to finale. It was known that Indian players had played well through out the tournament and perhaps that is the reason that every Indian was praising #TeamIndia . But, unfortunately victory and defeat are parts of game. If one won't lose, the other won't win. So, clearly either India or Australia had to lose the match. So, as i said its a part of game, India lost the match by 95 runs. And Australia won the ticket to finale. Generally, a game shouldn't be considered more than a game. But as all the fingers aren't same. There are few people who could not digest this defeat of India and they went crazy. And as we all know a crazy person can say anything and can do anything. So, these crazy gone fellows just put aside the whole, let me mention overall beautiful and victorious, journey of Indian team and done every possible stupidity they ever could have. And seriously i am not interested in mentioning those idiotic things here. What i wanna say is, no matter who is saying what, no matter who is blaming whom, i still have faith in #TeamIndia and i still adore #Teamindia . And i heartily thanks all the Indian players. 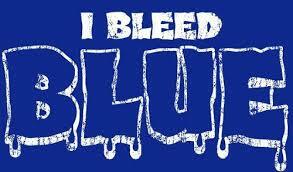 but i still Bleed Blue...!"